Any bonafide wine lover knows that there are very few countries that can rival the number of different grape varieties and styles produced throughout the 20 wine regions of Italy, land of unsung gems and underrated wines. And French wine, of course, is known to be among the best in the world: you probably won’t find a more enticingly diverse place to tour wineries. 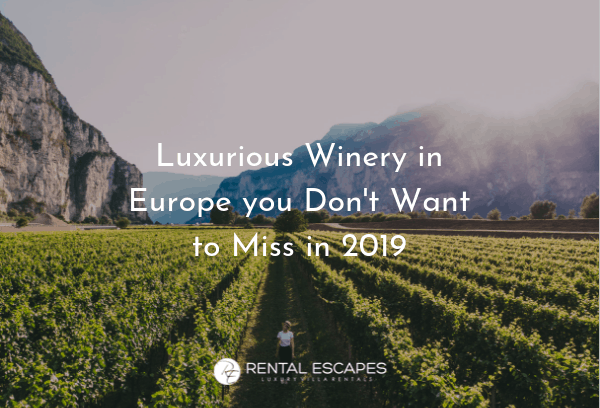 If you’re planning an upcoming wine tasting vacation, here are a few of the best and most beautiful luxury wineries not to be missed in 2019! Just 30 minutes from Saint-Tropez in the Provence Cote D’Azur region is the Château Sainte Roseline. Fittingly, it dates back to the 10th century, when wine was still treated as the drink of the gods. The terroir is 1000 years old and houses sufficient great vines to keep producing quality wine for another 1000 years. Now classified as a historical monument, Château Sainte Roseline itself is an old abbey and church built in the 11th century. The architectural style of its buildings also includes hints of charming Provençal color—pinkish and yellow stone from local mines. The current proprietors of the estate make about 400,000 bottles of red, white, and rosé every year. Run by Paolo De Marchi since 1976, Isole e Olena is a Tuscany family estate established in the 1960s. The 45 hectares of vineyards, located 350-450 meters above sea level, produce sumptuous Chiantis. The wonderful Sangiovese-based wines made here by De Marchi are fast-becoming renowned worldwide for their finesse, balance, and purity of expression. In addition to their most popular wine, the Cepparello, their high altitude Syrah and Cabernet Sauvignon also come highly recommended. Built in the traditional architectural style of Provence, the Château offers 200 hectares of forests and 72 hectares of vines up to the gods of great wine. Built in 1830, the Château des Demoiselles estate is situated in the heart of gorgeous Provence. It was owned by the Grimaldi family, ancestors of the Princes of Monaco. The entrance is guarded by huge sycamores—a fitting indication of the grandness found inside! Founded by three cousins, Alessio, Francesca, and Santi Planeta, Planeta is one of the most successful, quality-obsessed wineries in the Sicily region. The cousins only began their winemaking adventure in the mid-80s, yet now, their operations have expanded throughout Sicily to include a site 870 meters above sea level, on Mount Etna, where the soil is rich in black lava sand and minerals. Their Nero d’Avola and Syrah, as well as the mineral-rich Carricante, are very much worth a taste. Their whites are nothing to balk at either: try the Cometa, or their vibrant Chardonnay. Is your wine adoration adequately stoked? Book your luxury vacation rentals in some of the finest world class wine regions of Italy and France. Get in touch with us at Rental Escapes today.